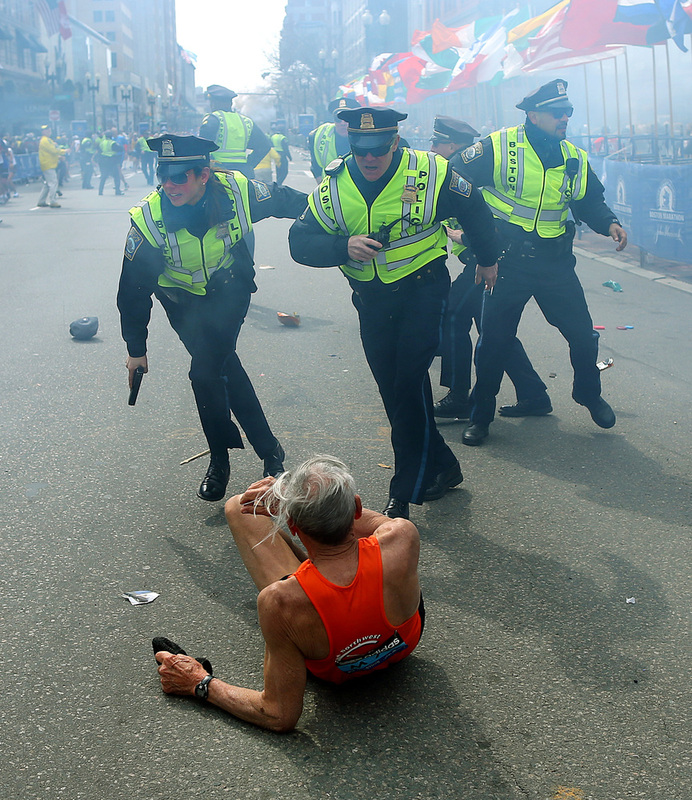 Within 55 minutes of being posted, Doug Lorman’s video of the Boston marathon explosion, recorded from a television news report and shared to Twitter, had been tweeted more than 15,700 times, and seen by over 35,000 people. Those without Twitter texted the link to friends. The video was posted through Vine, Twitter’s video-sharing service that launched earlier this year. Because Vine limits videos to just six seconds, and because it automatically replays those six seconds of video in a continuous loop, Lorman's Vine showed the initial bomb blast playing over and over, horrifying six seconds after horrifying six seconds. As soon as the video begins to play, there’s a flash of yellow, followed by smoke. Flags topple and people keep sprinting toward the finish line. It starts again. There’s smoke billowing behind the flags, which are jostled into the street, and runners looking around. It starts again. Smoke, flags, runners. Other details begin to emerge as the video plays itself for the third time, then the fourth. The clock counting up from 4:09. A runner in the middle of the frame who ducks, whose legs give way and who tumbles onto his back. The video loops and he gets up, then falls again. People still jogging toward the finish line. A person whose arms are raised in victory. Questions come to mind: Is it strange that they kept running? Is it normal? What was behind the flags? Who else was there? Other Vine videos were shared in the aftermath of the explosion, some showing Twitter streams rapidly updating with news, others documenting the scene on the streets, still others recording news reports through TV screens. Few, so far, have had the reach and instant impact of Lorman's, but the decision to use Vine prompted speculation that a turning point has come for the young platform. “Vine's Tahrir Square moment?" tweeted Nicholas Jackson, the digital director of Pacific Standard. Alex Goldmark, a producer for WYNC, also opined on Twitter: "Vine sure is getting it's [sic] moment now as a breaking news tool." All eyes may be on Vine, and the Boston bombing has elevated the service to new prominence. It also has validated Twitter’s bet on adding video to its bevy of text- and photo-sharing tools. But in the initial hours following the first reports of casualties at the Boston Marathon, it seems more pressing to consider not what the tragedy has meant for Vine, but what Vine’s rise might mean for us. Every new popular technology changes how we experience the world, and we see that perhaps no more acutely than during disasters. Twitter, for its part, has made the news of strife, tragedy and upheaval more personal and immediate, as we’ve seen during events such as the Newtown shooting and, as Jackson noted, the Arab Spring. It’s allowed people to share dispatches from their viewpoints while on the go. YouTube likewise allowed for the sights and sounds of disaster to travel quickly. Yet more than photos posted to social media sites and more than the videos uploaded to YouTube -- both widely shared in the aftermath of Monday's explosion -- Lorman's Vine video was a chilling, unrelenting vision of the moment of the bomb's impact. It zeroed in precisely on the instant when everything changed, and played that instant on endless repeat. Vine allows users to record six seconds of the greatest emotional intensity and play them without pause. In Lorman's video, there’s no chance to even take a breath before the explosion starts anew. There's no break in the video, and no break from the video. It's worth bearing in mind that Lorman's Vine wasn't even taken at the scene, but was filmed through his television screen. "I taped the Boston NBC feed," Lorman, 29, wrote in a tweet. "I was hoping one of my cat vines was popular, not this tragedy." Lorman, or @Doug_Lorman on Twitter, lives in Nashua, N.H., about 45 miles north of Boston, and identifies himself in his Twitter bio as a "geek, hockey fan, atheist, and married to the greatest woman alive, Jess : )." "I decided to Vine the video because at the time, no major news station had even begun covering the story," Lorman wrote in an email. "My real goal was to let people see what anyone not in the Boston area would see. I am sad it was that popular, I wish my Vine account didn't get this attention this way." His video's impact had more to do with its timing than its novel or unique viewpoint. Many others saw the local news broadcast, but Lorman caught it and posted it precisely when he did. Photos captured a moment in time, videos and news networks captured multiple moments in time and Vine captured the moment in time -- and played it in a loop where the violence doesn't let up or end. Does that make us feel it more? Less? Longer? Unfortunately, we may have more opportunities yet to find out.